Add a touch of beauty to your home and make a difference in the process! The profits from your purchase will be donated directly back to elephant conservation efforts. A Petali Teas exclusive. Silver plated Keepsake Tea Infuser handcrafted for Petali Teas by artisans in India. Fits in a mug or a teapot. Packaged in hand stamped natural fiber bags with drawstrings. Elegant silver tea set which includes a teapot, creamer, and sugar container. A Petali Teas Exclusive. 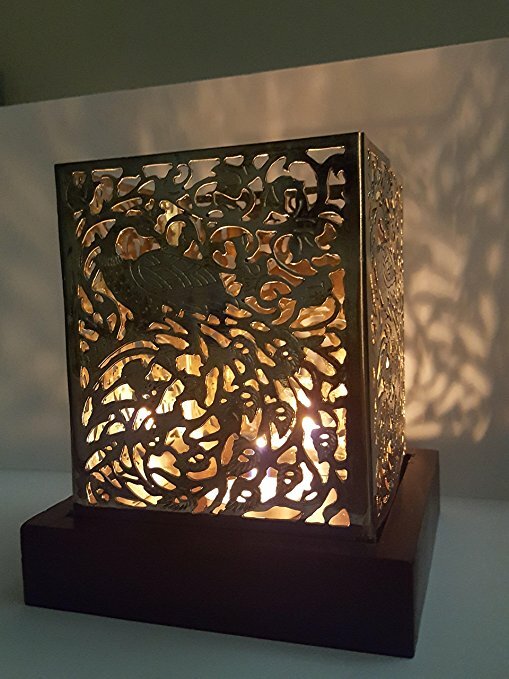 Silver candle lantern featuring an elephant design. Casts pattern on surrounding walls when candle is lit. Women's slim cut white t-shirt with the Elephant Approved® logo. Sizes run small! A Petali Teas Exclusive. This tea scoop, designed by Petali Teas, is perfect for measuring one perfect pot of tea or one perfect cup of tea. It features a line of elephants marching together. Beautiful one of a kind, handmade Kantha quilts! Fits a queen sized bed (88"x100"). These gorgeous quilts are not padded, but made with two layers, hand stitched with Kantha quilting. These are heirloom pieces that make a gorgeous addition to any room. Click on each picture to buy on Amazon.